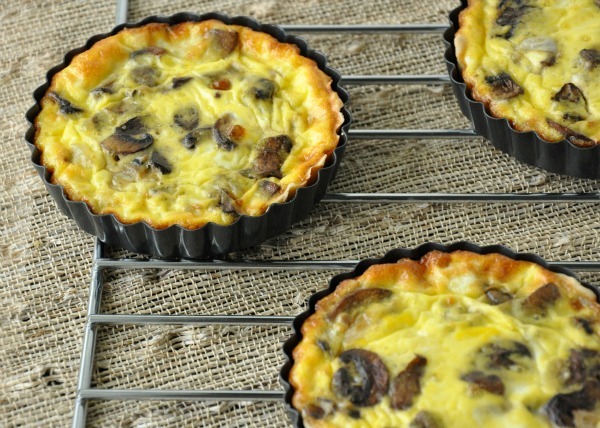 These super simple mini mushroom quiche are perfect for breakfast or brunch! Buttery mushrooms and creamy swiss make them flavorful and fantastic! I’ve been a teeny bit cranky lately. Staying up late tearing through the ginormous stack of books beside my bed, making ridiculously long lists of things I want to cook/bake/create, and doing laundry at ungodly hours has resulted in restless nights and difficult mornings. Hitting the snooze button and missing my morning workouts only ups the biotch-factor so, now that a new week has presented itself, I’m determined to wake up on the right side of the bed and get my act together. These super simple mushroom swiss quiche are perfect for breakfast or brunch! Buttery mushrooms and creamy swiss make them flavorful and fantastic! Slice the mushrooms, mince your garlic, and dice your onion. To make the crust, first mix the flour and salt with fork. In a separate bowl, beat the oil and water with a whisk or fork to thicken. Divide dough into 4 equal parts and press each flat on a solid surface. You'll want to press the dough super thin so it comes out flaky and magical. Then press each doughy disc into 4 mini tart pans and season each with a little freshly ground black pepper. Making one big quiche instead? Press the dough into a 9-10 inch pie dish. Saute your mushrooms and onion, adding the garlic towards the very end to prevent burning. Season with a little salt, pepper, and even a little garlic powder for added flavor. Beat the eggs until the yolks and whites are incorporated and add the cream. Top the crust with your veggies and swiss and pour in egg mixture. Bake at 350F for 30-35 minutes until the edges are slightly golden. Recipe yields 4 mini quiche or one standard 9 inch quiche with 6-8 slices. 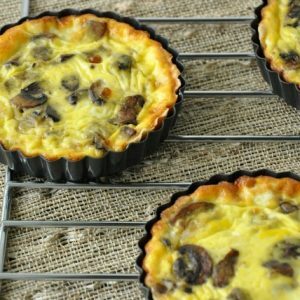 If you get a chance to try these mini mushroom quiche, let me know! You can leave me a comment here (LOVE checking those daily!) or tag @PEASandCRAYONS on Instagram so I can happy dance over your creations. I can’t wait to see what you whip up! Leftover quiche slices/minis can be frozen for a few months or stored in the fridge for up to 4 days. They re-heat like a dream in the toaster oven or even in the microwave when needed. And they taste pretty awesome with hot sauce too — but then again what doesn’t taste good with hot sauce on top? I don’t feel like typing anymore. I just want to go eat quiche. Gosh! Ok maybe the crankies are back. But these are super yummy and I look forward to inhaling them for breakfast all. week. long. A second batch (with asparagus) is on the menu as well. Mmm and more of these too. This is the mushroom quiche I’ve been looking for. How would you modify the amounts for a single, pre-made 9″pie crust? I love quiche and yours looks amazing. Haha thank you thank you! <3 My week is going *much* better now! =) Happy Wednesday! Good job and cheer up! Congratulations on making the foodbuzz Top 9! These look so yummy! And those mini molds are so stinking cute. I gotta get me some of those soon! this. looks. amazing! Everything I’d want in my quiche in one little bowl. I haven’t made quiche in forever. These look great and the mini factor always for multiple meals. I hope things start to turn around. I have a basket full of morels. guess what the captain and I are eating Wednesday morning? My sister will probably eat half a dozen. Gosh, I love quiche…although, I tend to only think spinach or arugula…oh hell yes. Ooh those look delicious! Might have to leave the mushrooms out though if I make them. I have a Cannon Rebel, and I do not use flash or auto but still can not get my pictures to look good. When I make something during the day I take the pictures in natural light, and they are still lacking. I wish I could find a food styling and photo class or a really simply tutorial!! I feel like I have really good recipes but do not look like it! These look so good! What kind of camera do you use to get such great pictures? Not only do those look delicious, they’re so cute too! looks so yummy 🙂 im def going to make this for the fiance and family asap! Love mushrooms and love quiche! The simpler the recipe the better it is sometimes! Can’t wait to put this on my list of things to make this week. Would it work with something lighter than cream or half and half? Those are a bit heavy on my stomach sometimes – maybe almond milk mixed with Greek yogurt? They look great! The mini pans are adorable! Make this one for you!!! its amazing. like ah. maze. ing. https://peasandcrayons.com/2010/08/quice-revisited.html <3 you! Hmm my favorite make-ahead breakfast would probably be some type of muffins … just because there aren’t many breakfast foods that I prepare ahead of time. And I’m not a big mushroom fan, but my husband is. He would love these. Perhaps I could add asparagus or something into mine instead? im not a mushroom fan but these look tasty! maybe i can make them and sub in peppers! 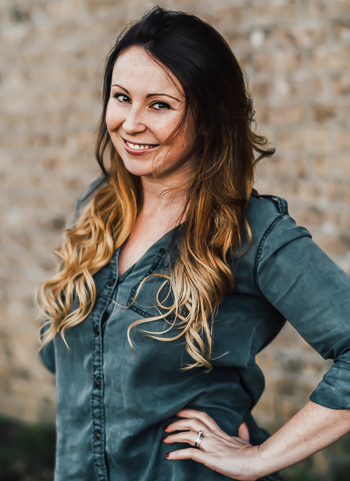 xoxo jillian:: don’t miss my $50 NOVICA giveaway! ummmmm i love you! and can we please plan something before one of us ends up moving far far away? kthx! p.s. I miss your face. YUM!!! My favorite breakfast is a simple make-ahead that my husband and I have literally made for a decade- it’s our daily breakfast that we used to make for guests when we lived at a bed and breakfast in college…it’s a souffle but very similar to what you have here, simply beat 2 eggs, a little cheese, a splash of cream and some summer savory seasoning…..
Me & fungus are pretty much bff. LOVE the shrooms! I love mushroom quiche! These look so yummy!! I love your mini quiche pans! This looks great and like you said, super easy too! Keen to give it a try after I get my presentation done :). Thanks for sharing! This could be breakfast, lunch AND dinner for me! Yum, they look so good, Jenn! !